Scores from they are having record high temperatures in AZ bike tour. 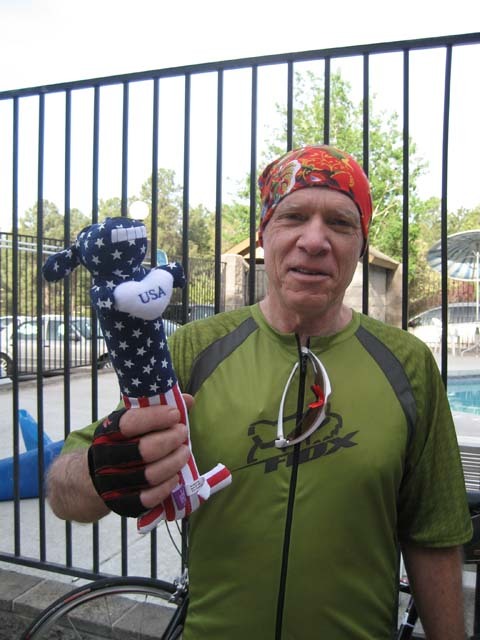 I started out riding with Jack Rubin and we stopped to take fluids. Jack W. comes by and says take my wheel. He put down the hammer big time. 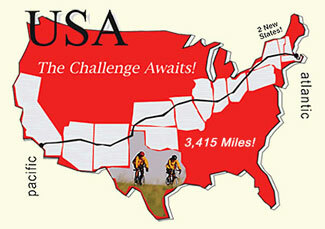 At two hours, even though we have ridden four miles in Flagstaff, we had covered 42 miles. At 76 miles we are riding with Jim Lyle, the fastest rider in this group. Jim had already had two flats. We were never below 20mph even into the headwinds. Other big riders had flats and Jack and I were 2nd into the hotel. After we cleaned up we went to go across the street for lunch and a sandstorm was roaring. I cannot imagine what other riders went through. When eating lunch Jim leans across the table, sticks out his hand, and says welcome to the throughbreds. What he does not know is I am completely exhausted. Note to Leslie: The bike shop in Flagstaff raised my handlebars 2mm and increased the angle by 5%. They put bar phat on my handlebars and I wore two pair of gloves. I think this will work. Thanks. A thoughtful gift from Rich. He bought it so I could exercise my hand. He gave it to me at breakfast and said I should probably wash it before I use it. Why Does Rich have to leave his daily comments crack me up! Al you are Thouroughbred? CRAZY as HELL but a Thouroughbred! Al -glad to see your still CRAZY after all these years, keep up the good work! 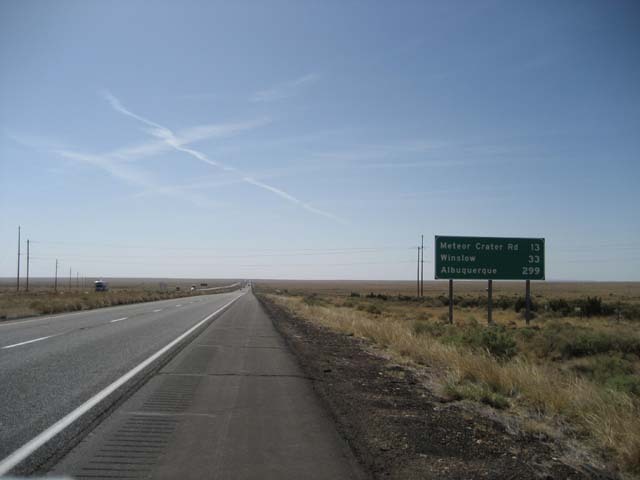 Bill P. - I know in states like Colorado, it's entirely legal to bike on the shoulder of the interstate where so indicated. With that said, it's not something you'd want to do often as it's not very pleasant. This is excellent. We need a new person to do all the pulling for us since Dave isn't pulling like he used to. Now we can leave him at Zou Zou's peacefully eating apple fritters while you pull for us on the Waterloo loop. Roddy, Speaking for horses out of the barn, you know he's going to be insufferable about this thoroughbred thing so maybe you could make some money off it and get him a match with Rachel Alexandra. If you really think he's gone off the deep end, you could make it a stakes race and maybe someone would claim him. Your blog is great! You make me want to do this kind of trip. I bet you I could talk Katie into doing one really easily. Have fun! 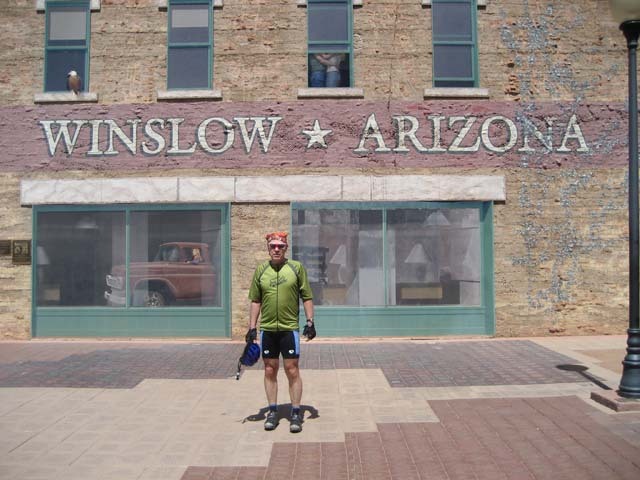 so there is a winslow,az.! what else are you going to uncover?? sand storms-what a blast- good to miss tho. Al, I've been enjoying your trip reports. Question: I thought there were minimum speed laws for interstates. Do you have to get special permission to bike on them? Are you ever tempted to race when cars ease by? Hey Thoroughbred - congrats! Beats the Wonderbred designation (as in whose child is this?) Let me guess, we should now address you as Clyde. Dang, not only do you ride well, you look good doing it - perhaps Clothes Horse may be the more apt moniker. Be well, stay safe, and we sure hope your hands don't go numb. Is that a rabbit missile you're squeezing? The reason for no road kill? The animals are smarter than you - they know better than to be on the highway when the temp is so high. Uncle Allan, when you were in Winslow Arizona, did you see a girl, my lord, driving a flatbed ford, and was she going in your direction, and if you did and if she was, why didn't you throw your bike into the ford flatbed and hitch a ride to Holbrook?